Miranda's dark eyes reflect the gold and argent treasures of the Hall with a sinister gleam that belies her small stature. The others were quiet, so surely they wouldn't mind dealing with that giant critter while she inspects the valuables? She signals to Ptolmek Skarab to distract the beast while she has a look around. Fascinated by this hall of antiquities her attention is drawn by the ceiling mural and she will take a moment to peer at it. Ptolmek wields his weapon and fixes his feet firmly, ready to charge in and attack the monstrosity. Miranda curiously inspects the ornately carved door to the East. Searching for traps, she finds none - and the door opens with a little prying of the ancient lock. A tile labyrinth covers the floor within the small closet. The tiles are made of four blocks, loosely assembled, which sit recessed into the floor. Each block is easily removable. Miranda notes that on each face a portion of a rune is engraved into the block. As the party came into the sanctum Morcant decided to examine the rune hidden in the blackened hallway. Perhaps the darkened aura would reveal insights into the mystical protections this place is hiding. But upon closer examination it appeared that the rune was merely a masking stone of some sort. The light it cast made torn and tattered objects appear whole and lustrous. And it was a trigger for the devious sand trap which would surely have filled, and killed members of the party. At the far western terminus of the hallway, the group found a dead end. Backtracking and taking a side corridor led them back to the familiar Inner Sanctum and a gory display of weapons proficiency. Gurin was excited about the doors in this room. 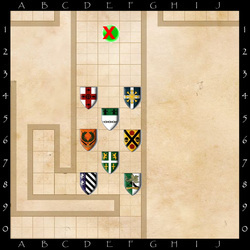 He ran down to the portcullis to the south. 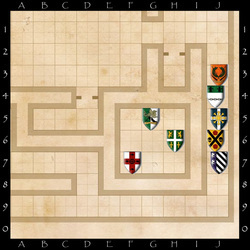 Thinking back to the first time the group assembled in the Gatehouse, Gurin recalls the familiar sound echoing throughout the halls of the Vaults. Gurin smiled then, and placed beefy hands on his hips, leaning backward in satisfaction. The sounds of ancient gears turning and mechanical portcullis sliding into waiting sleeves had let him know the Vault was open to unhindered exploration! He was hoping that the earlier efforts had opened the portcullis which Blackbird had warned him about. Gurin loved a good poisoned dart trap door, classic stuff! But he preferred that everyone in his party, including himself, remain poison free when possible. Catching up with the eager Dwarf, the entire party followed, certain he was on to something significant. The final grains of sand fell through the center drain which was opened as the rune was shattered. The armor and weapons sat faded and worn with time. Ptolmek knew those inside the chamber had escaped a certain death trap. However, his curiosity got the best of him and he peered inside. The Armory held only dusty armaments which would not have any use to him. Turning with a huff he proceeded down the hall and turned into the westbound corridor. Miranda shook off the effects of the hard fall. She nodded in admiration of the deadly trap. Sand could kill as easily as water - it flooded the lungs just as menacingly. Death came too easily for the unwary explorer. She got the cobwebs out of her brain and looked around the room more closely. She inspected the corners in the ceiling from which the sand had poured. The blocks of granite appeared seamlessly fit into their notches, and there appeared to be no method of moving them again. Not that she wanted to invite danger again, but she was intrigued by this particular trap. The sand continued to cascade out of the corners near the ceiling. On the floor a rising layer of silty granite sand was pooling around the adventurers feet. It moved and acted much like water. But if they stood still too long the grains wrapped themselves around the occupant's ankles like rising quicksand. It took great effort to break the surface tension of the sand, and pull one's foot up onto the surface again. And with each climb upward, less of the room became available. Morcant felt a surge of urgency and alertness from Gurin, the mind-linked dwarf, as soon as the door slammed shut. Morcant quickly cleared his mind of any controlling thoughts. This was a situation which the dwarf would need his own expertise and no outside influence. Morcant attempted to put his talents to work replicating Gurin's earlier work. He reckoned the opening of a hidden passage couldn't be that difficult - especially if a dwarf was successful. What he failed to take into account were Gurin's decades of training and expertise with traps, locks, doorways, and dwarven construction techniques. Gurin wheeled around, eyes fixed on the chain jerkin and the place where it just was. Something there had triggered this trap. Gurin couldn't discern an apparent trigger but suspected a pressure plate system. He yanked the jerkin from Marlit's hands and placed it back where he assumed it belonged. Oddly enough, it seemed as if the sands began to pour faster. 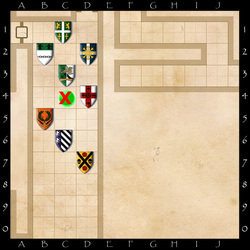 The party called through the hall to one another about what had been discovered. Alerted to the existence of the cache, Ptolmek proceeded to the doorway and stood guard outside the room. If anyone would gain from this revelation, it would be his adventurers. Miranda began to search through the equipment in the Armory. Her attention fell on the weapon racks. Paying close attention to the wall rungs she noted they were all fixed in place securely. Not one of the notches would ever move, unless smashed by a great hammer. These small fixtures were carved, somehow, directly from the virgin stone of this mountain. Gurin snapped out of his trance with exhilarated pleasure. He searched the room carefully and grabbed a crossbow with an elegantly inscribed leather strap which he hung across his back. He searched for rope but came up empty. It appeared to him the purpose of this room was armaments and not tack. About two years ago Dungeon World wrapped up their successful Kickstarter, and Sage Kobold Productions entered the forefront of tabletop roleplaying games. 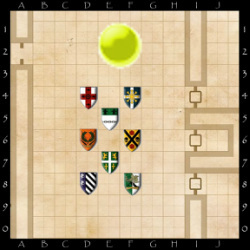 The game quickly found favor with countless dungeon masters, and players around the world. The modern rules mixed with old-school style seemed to be just what the gaming community wanted. Since that time many blog and video reviews have continued to support the game systems bold claims. Simple Rules, Dynamic Play, Classic Adventuring, and Highly Customizeable being the key features touted. 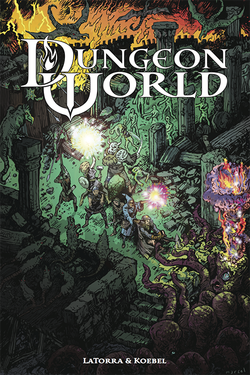 Many actual play recordings, from some of the highest rated podcasts on iTunes, have also showcased Dungeon World. One of my favorite examples od Dungeon World at work so far is from The Esoteric Order of Roleplayers. They took a break from Deadlands for one session to try the indie RPG Dungeon World. And in moments their featured players Des, Jen, Jade, Dave, and Brendan - all new to Dungeon World - picked up the rules and exhibited some excellent gameplay. And get this! Dungeon World - while a highly successful Kickstarter from a commercial firm - is still shared openly and freely online! Dungeon World's entire text is released under the Creative Commons Attribution 3.0 Unported License. That means you are free to make anything based on Dungeon World for fun and profit so long as you credit Dungeon World. That spirit of openness has led to all kinds of player and game master created supplements. I am beginning to explore the Dungeon World system for possible improvements to Realms of Adventures going forward. There are many ways to use Realms of Adventures right now - to explore different themes. However, the focus on narrative story advancement with every round is what piqued my interest in Dungeon World! Tabletop Talk Interview with Adam Koebel, Co-Creator of Dungeon World! The Gaming Paper 'Megadungeon 3, Sewers' on Kickstarter is Fully Funded! Which is great, because that means anyone who contributes before project funding closes will get some great stretch goals. While you're at it - check out their track record on Kickstarter. The Megadungeon 1 and Megadungeon 2 battlemaps are exquisite. They even come with prewritten adventures your players can enjoy. If you haven't heard of them, Gaming Paper produces the latest innovation in roleplaying and miniatures accessories. 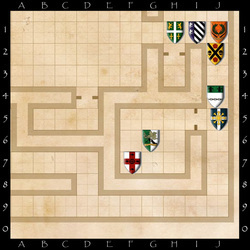 Their low-cost alternative to expensive battlemaps and tile sets are great. It's an inexpensive, reusable and disposable way for gamers and dungeon masters to really ramp up their adventures. First let me say that this is not an original idea, but one I borrowed from elsewhere. But it applies in spades to the roleplaying games being enjoyed at Realms of Adventures. Play-by-Blog in its very nature has an enemy. That enemy is all-powerful, ever-present and strikes at any time without warning. That enemy is called Real Life. We have all been there. A game is fun and interesting and then a player (or the GM) is suddenly gone without warning. It is frustrating at best for all the others in the game and also very often caused by that monster, Real Life. We know this cannot be stopped, nor should it be! Real life, family, jobs, etc. SHOULD always come first. For a game or hobby to come first would be extremely bad. However, I believe there is a solution that satisfies both worlds. With today’s technology there are many ways to get on the internet; PC’s, phones, tablets, internet cafés etc. Many places even have PC’s you can use for free. This availability of technology leads to a theorem: No matter what Real Life throws at us, we can still find 3 minutes to post “Hey, the monster got me and I won’t be back for a month or more”. Wouldn’t that be preferable to just not knowing why someone was gone, or for how long? Well, I think so. Enter the Oath of Sangus; the Roman god of trust, honesty, and oaths. So how does this work? I am so glad you asked. By commenting here, I agree to take the Oath of Sangus. In doing so, I promise to never simply disappear from a game, either as a Player or a GM. When Real life happens to me – and it will – I agree to find 3 minutes to comment so that the others in the game know I have left, and if I shall return or not. I give my oath to never just vanish from RoA without a comment, even though it may be very brief. If I lose interest in a game or for ANY reason want to stop playing, I will let the GM/other players know I am leaving. If you agree to take the Oath then simply post a comment here stating you have done so. Then you can say so in your character sheet, comment signature, and email correspondence. This will let everyone else know that you will make your very best effort to never just disappear. This entry is NOT for opinions, or lengthy comments. You may or may not agree with it, but please have the courtesy to not post anything except taking the Oath as above. If you feel so strongly that some part of this should be discussed, feel free to Contact the Game Master. Thank you for reading, and for considering the Oath!